At some point when you are developing your microservice architecture, you will need to visualize what is happening in your service mesh. You will have questions like “Which service is connected to which other service?” and “How much traffic goes to each microservice?” But because of the loosely tied nature of microservice architectures , these questions can be difficult to answer. Those are the kinds of question that Kiali has the ability to answer, by giving you a big picture of the mesh, and showing the whole flow of your requests and data. Kiali builds upon the same concepts as Istio, and you can check the glossary for a refresher. export JAEGER_URL="https://tracing-istio-system. [[HOST_SUBDOMAIN]]-80-[[KATACODA_HOST]].environments.katacoda.com"; \ export GRAFANA_URL="https://grafana-istio-system. [[HOST_SUBDOMAIN]]-80-[[KATACODA_HOST]].environments.katacoda.com"; \ export VERSION_LABEL="v0.9.0"
Wait until the status for Kiali is Running and there are 1/1 pods in the Ready column. To exit, press Ctrl+C. The default credentials are "admin/admin", but it’s recommended to change them before using it in production. To show the capabilities of Kiali, you’ll need an Istio-enabled application to be running. For this, we can use the customer-tutorial application we created earlier. Note that you might need to select the tutorial namespace. 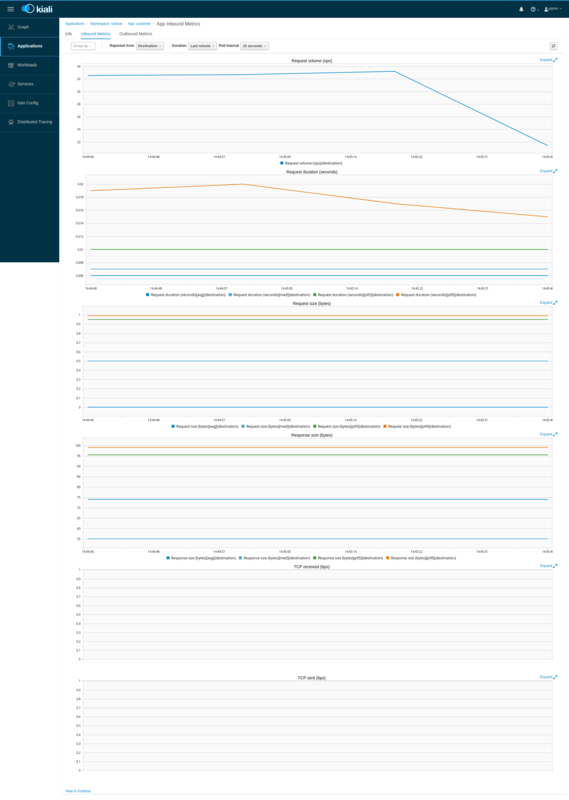 It shows a graph with all the microservices, connected by the requests going through then. On this page, you can see how the services interact with each other. Click the Applications link in the left navigation. On this page you can view a listing of all the services that are running in the cluster, and additional information about them, such as health status. Click the Workloads link in the left navigation. On this page you can view a listing of all the workloads are present on your applications. 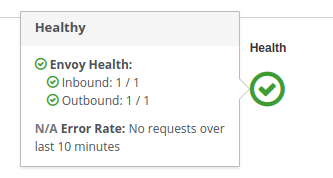 By clicking Outbound Metrics and Inbound Metrics, you can check the metrics for the workload. The metrics are the same as the Application ones. Click on the Services link in the left navigation. Here, you can see the listing of all services. Click on the Distributed Tracing link in the left navigation. The distributed tracing, provided by Jaeger, will open in a new page. NOTE: The tracing page opens in a new browser window/tab, so if it doesn’t open, please check if your browser didn’t block it from opening.